Of all the various kinds of roofs used for residential and commercial roofing, the most popular type is the flat roof system. Flat roofing, with its water and weather-proof membrane, is commonly installed in large buildings for the practical benefits it possesses. Flat roofing systems are economical, especially when compared to a pitched roof, and can help you save money upfront. Rooftop Garden – In addition to enhancing the aesthetics of the building, having a rooftop garden is beneficial in the form of maintaining a refreshing atmosphere and reducing stormwater runoff. Space for Relaxing – If you need a separate place for relaxing and lounging, a flat roof can meet this need by incorporating some seating, tables, and greenery. Employees can use it to get fresh air, or as a place to have coffee and lunch breaks when the weather is nice. It is quite common for an HVAC unit to get damaged by nearby equipment, surrounding trees, and people when you place it on the ground. Keeping it on the roof is a wise decision because it provides security and protects it from harm. To install the units correctly, you must hire roofing contractors. They will examine the roof structure to verify its strength and capacity. This can help you avoid the problems of puddling, low spots and leaks due to improper installation of the roof. Flat roof systems, in general, require less installation time because they require less equipment, labour, and materials. In addition to this, they also result in fewer disruptions because you do not have to stop your activities temporarily. 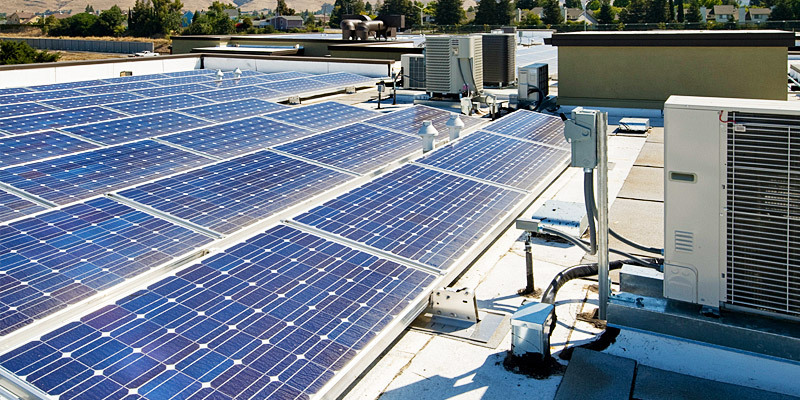 When it comes to installing solar panels for saving energy, flat roofs are the best option among the other roof types. It will enable you to optimize the right angles for solar panels and help you get the most out of your investment. It is quite easy to fix any component of a flat roof. The minimal slope of the roof not only makes it effortless to navigate but also makes repair work comfortable and safe, reducing the chances of any mishaps. The various benefits of installing a flat roof, undoubtedly make it a worthwhile and feasible option for your building. 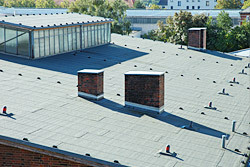 Can-Sky Roofing is one of the leading commercial roofing contractors in Toronto. We believe in efficiency, accuracy, and competency, and provide various services including flat roof installation, repairs, and replacement. For more information about our services, you may get in touch with our team by calling 647-691-0487 or contact us online to discuss a project.